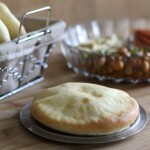 The Holy Land will be my destination today for the pita recipe! For pita bread, I could have picked its origin from several countries including Iraq, Turkey, Syria, Jordan, Lebanon, Egypt, Iran or even North Africa, to name a few but I feel a deep attachment to the Promised Land. This is my haven. There is not really an Israeli cuisine. Israel is a country of minorities founded by immigrants from a multitude of ethnicities from many countries. The gastronomic heritage of Israel is extremely varied and in this country of immigrants, people praise as much shakshuka, hummus, falafel, or schnitzel (breaded chicken cutlets) as the national dish. 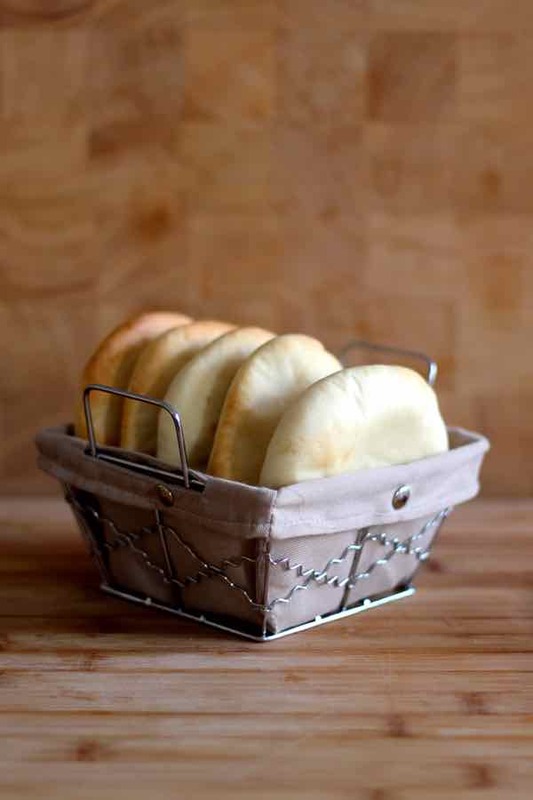 But if there is one staple that is omnipresent on any authentic Israeli table, it would be pita bread aka pita (plural pitotes), and this is the recipe I chose to prepare today. 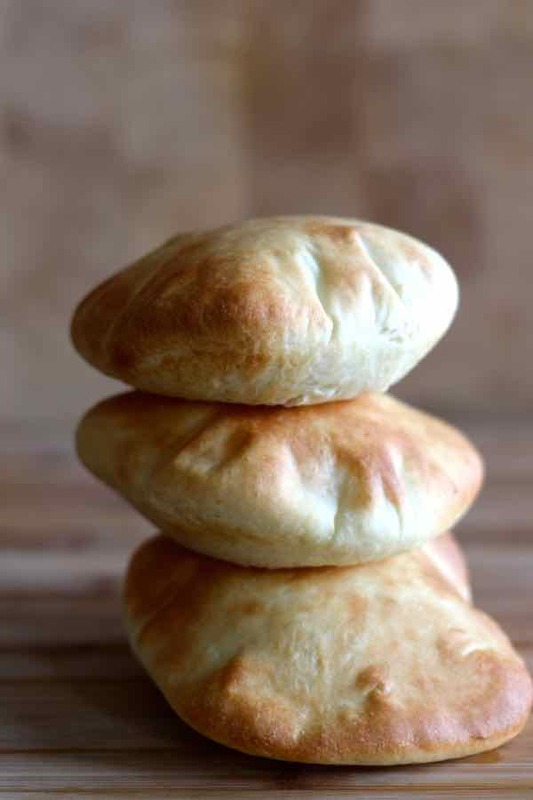 Pita has different names depending on the country: كماج (kmaj) or خبز عربي (Arabic bread) in Arabic, питка in Bulgarian, Հաց պիտա (Hats pita) in Armenian, πίτα in grec פִּתָּה or פיתה (pitta) in Hebrew, pita in romanian or pide in Turkish. Incidentally, the word pita is the etymological origin of the word pizza. 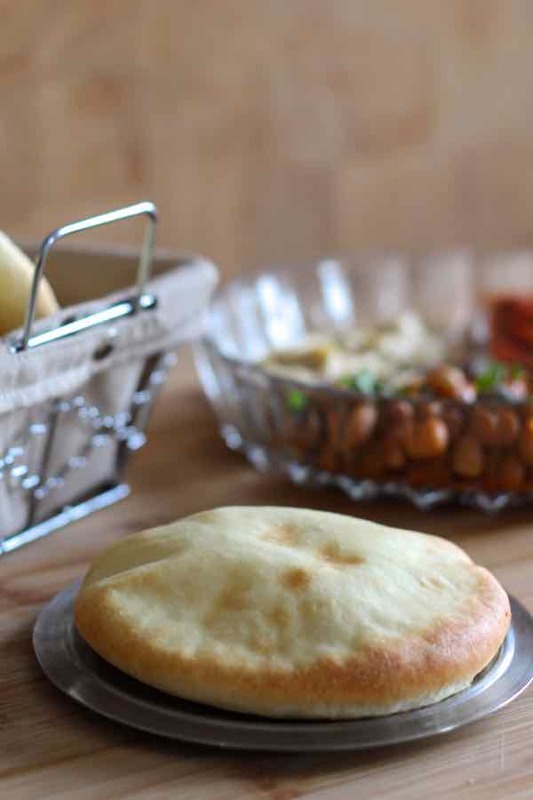 The recipe for pita bread is widely popular in several cuisines in the Middle East, Near East, the Balkans and the Mediterranean. Pita is a Greek term that literally means “flat”. 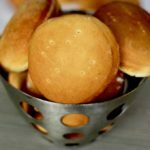 So, besides its round and flat shape, the main distinguishing characteristic of this bread is that it has an air-filled pocket between two flat layers. How do you make authentic pita bread? But how exactly do you create this very surprising pocket, quite unusual and different from most other types of bread? The pocket is actually formed as the dough rises through the huge amount of steam and very high baking temperature. 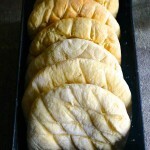 The bread has two flat layers and it is baked very quickly at extremely high temperatures. Thanks to this process, the dough bakes rapidly and separates in its center. This immediately creates a large air bubble, like a balloon that is inflated, and the two layers are separated to form the inner pocket between them. The pita deflates as soon as it cools, and lo and behold, the pocket remains! This small round pocket has been a staple in the Middle East for over 4,000 years. 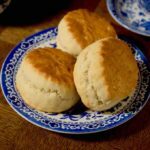 In fact, this bread was originally served both as a bread and as a utensil. Pita bread then spread out to all the East, and to many Mediterranean countries. It spread to North Africa, to all the Levant, the Arabian Peninsula, but also India and Afghanistan. Pita bread would draw its origins in the Babylonian Talmud. Marcus Jastrow’s Dictionary of the Talmud explains that the Hebrew word פיתא (pita) is the Aramaic translation of the Hebrew פת (pat), which means a piece of bread and the Encyclopaedia Judaica transformed פַת into פִיתָא, adding vowels. So ? 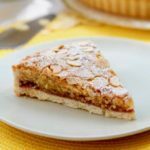 Since we can also read in The Collins Concise English Dictionary that the etymology of the Greek word pitta means “cake”, would the word pita come from Hebrew or Greek? 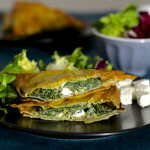 Although pita bread is very common in Greece, everything indicates that there would be no connection between these two words. Their only similarity is their sound. The root, פת (pat), also appears in the Tanakh (Bible and prophetic texts) and comes from the root פתת, meaning “to break into pieces, fall apart.” This is also the origin of the modern Hebrew word פתיתים (ptitim), these famous little pasta known all over Israel and also the word fatut, the well-known bread from Yemen also very common in Israel. Pita bread is to Israelis what baguette it to the French or ciabatta to the Italians. 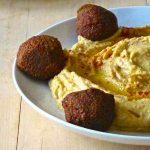 As Mike, our king of falafels, explained to us last year, the “pita/falafel” sandwich is the undisputed national dish in Israel accompanied by the equally famous hummus, of course! Shawarma and kebabs are served in a pita and other local sandwiches are made with cheese or charcuterie. As for market stalls and bakeries, they are both always overflowing with piles of pitotes. I prepared these pitotes for an evening with friends at home. On the menu, several Middle Eastern salads and, of course, falafels but also Mike’s delicious koodibeh recipe. That night, my friends had planned for me to add a large dollop of baba ganousch (aubergine dip) in my pita but as I hate eggplant that will probably happen in another life! Full on Israeli atmosphere today! My pitotes were delicious and we were all in Tel Aviv for an evening! 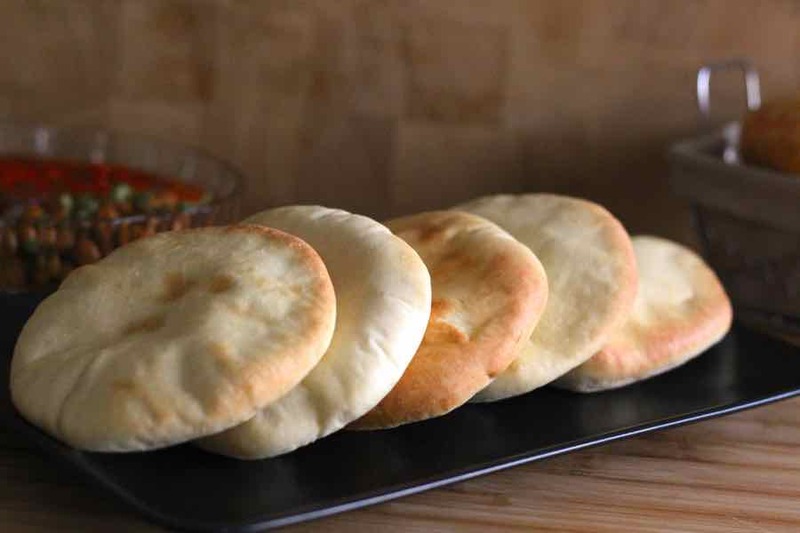 Pita bread is a soft and thin flat bread, consumed in the Near East and Middle East as well as in Southern Europe and the Balkans. Dissolve the yeast in a little warm water and let rise for 10 minutes. Pour the flour into the bowl of a stand mixer, make a well in the center and add the yeast, sugar and olive oil. Begin to knead with the dough hook and incorporate warm water gradually until obtaining a smooth and homogeneous dough. Stir in salt and knead for 10 minutes until reaching a soft dough. Cover with a cloth and let the dough rise in a warm place for 1 hour. Punch down the dough on a work surface and divide into 18 pieces. Form a ball with each piece and let rest for 15 minutes. Roll each dough piece using a rolling pin, to a thickness of about ½ inch. Preheat oven to 460 F and place a baking sheet in the oven. The oven and the baking sheet must be very hot. Spray all the loaves with warm water and place them on the hot plate. Bake bread for 5 to 6 minutes. This bread is supposed to swell during cooking. If it does not swell like, this could mean that your oven and the baking sheet are not sufficiently preheated. The pita deflates once it has cooled. This bread can be stored in plastic bags. Can you freeze these and then toast when ready to eat? Any info is appreciated! Yes you can. I usually heat it over the stove, without a pan, and flip to my liking. ? 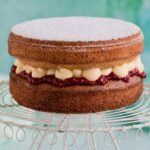 Hi, can I substitute some of the flour for wholemeal flour? Thank you so much for this recipe! I made these today for Shabbat dinner. It was my first time ever trying to make pitas. They are delish! Thank you again. Since there was so much history written on pita bread I thought I’d add, these small pockets are not small in the Middle East. My BF is middle eastern and I’ve been to 2 countries in the Middle East and 1 pita bread there is actually about as large as one of my t-shirts and resembles American pita little. They are like tjin blankets of bread that once split is almost paper thin. One bread will serve a few people at the dinner table and when you go out for a falafel sandwich , they will split the bread in half and wrap the sandwich with the paper thin bread. Furthermore, the best Middle Eastern bread is saj which is not yet popular in the US. 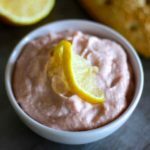 It’s sooo much more flavorful and easier to make to boot! That is very true that the Areb pita is bigger and thinner, I personally like the Israeli style better because it’s softer and has more flesh, less breakable then it’s Areb sibling. 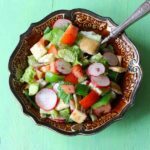 I will definitely try this recipe as it is almost impossible to find the Israeli style pita in the US, some Palestinian restaurants and bakeries will have them, but no grocery or other regular stores do. Also, some of the information here is not overly accurate or fully written. I will maybe come back another day to point the places. But not at the moment. 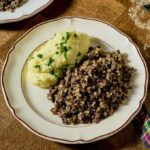 Thank you for an enjoyable post and for the recipe. I’ll definitely come back to say if it came out like what we have in Israel ? Simon “Pita” Bar-Jonah was a Hebrew: Kaph (Pita) and Keph (hollow rock). Passover, Unleavened Bread, and First Fruits. This recipe did not work. It came out very doughy with almost no flavor. Elisha through some flour into the gourd stew to make it better (remove the poison). taste better? 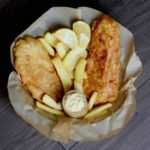 Have you ever heard of the POCKET FISHERMAN sandwich? FOR THE MEN: Pita bread, plain white cream cheese, dried/salted seaweed wavers. diced/puree/preserves/jam. The reformed POCKET PROSTITUTE. a Pina in group taxon Pita (Aloe, Agave, Yucca, Century Plant, wild pineapple). I can use any kind of flour ? Thank you. Hey Noru, bread flour is always recommended, but you can use all-purpose flour too. Enjoy! If I want to try only for 2 cups of flour.Should I reduce other ingredients to 1/4? Yes Seema. Also, you can adjust the measurements with the slider by clicking on the # of pitas (here 18). Enjoy! 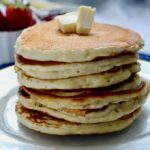 Do you have metric measurements for this recipe, please? Hallo, bei uns in Deutschland kann man die normalen Backöfen im Privathaushalt nicht heißer als 250-300 °C stellen. Braucht man für Pita einen speziellen Backofen? Mein Backofen geht bis 300°C. Und ich habe einen Lavatonstein zum Brot backen, der 1/2 Stunde vorher im Backofen aufgeheizt wird. Traditionally, we like to work the dough with our hands. Just like in ancient times. But I wonder how long does it take, according to the Israeli “breadmaking heritage”, to knead the pita dough? Perhaps, a bit less than average bread, I suppose (with no second rising time involved in the process). I will definitely try this. It reminds me of the small and flat loaves that grandma used to cook directly on the heated side of her old backyard furnace or on the stove. Hey Steph, thanks for your comment. Actually, the recipe does not change if you knead by hands. You’d just have to double the kneading time. Enjoy! I think a perfectly fresh pita sounds so lovely! I may have to make some in Pita Oven. I love hummus and falafel but I’m thinking honey and butter on a hot from the oven pita would be to die for. Oh, yum!